Some of my students in the Introduction to SAS class were having trouble reading in a tab-delimited text file, and it’s not too surprising, because some of the student in the Introduction to R class were having problems with the same file. Here’s some details about the data set, what problems it caused, and a couple of ways that you could fix it. Notice how this website mixes the data in with the description of the bad. This is a bad practice, for a variety of reasons, but for a data set that is free, you shouldn’t complain. The easiest way to read this into SAS is to cut-and-paste the text file into a text editor like notepad and save the file in your data subdirectory. There are a couple of subtle things that you should notice about this text file. 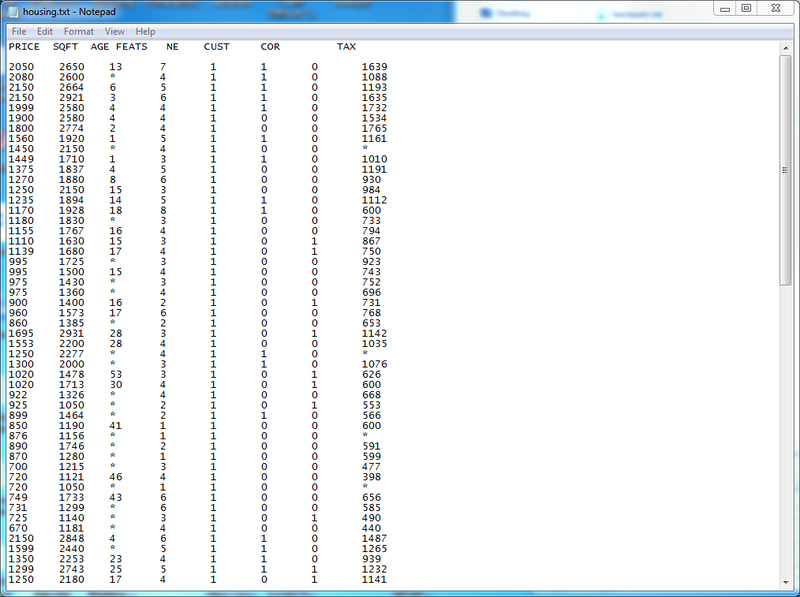 First, notice how nicely aligned all the data values are. 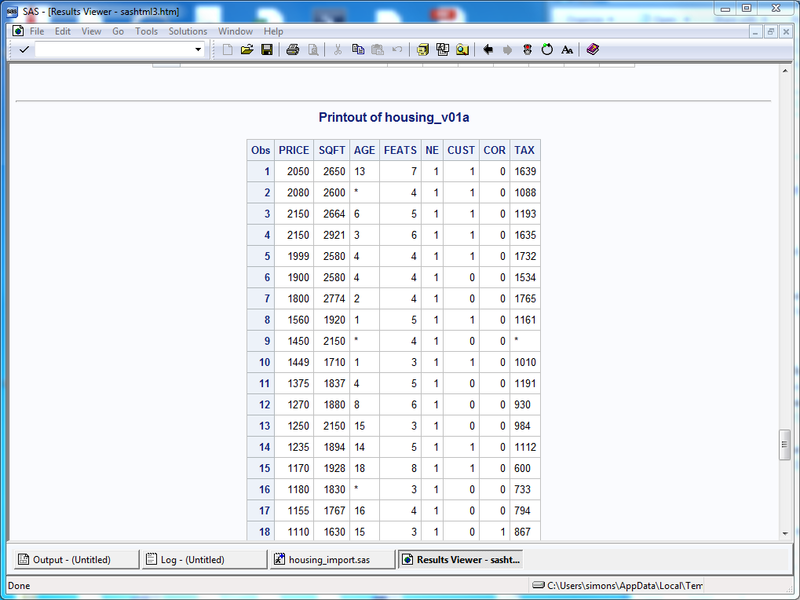 The second, third, and fourth columns of data, for example, always starts exactly in columns 9, 17, and 25. The evenness and the fact that the column starts are exactly 8 characters apart is a pretty good hint that this is a tab delimited file. It could be a space delimited file, with multiple spaces instead of a single tab, though, so you should investigate further. One additional hint, which I can’t show with a static screenshot is how the cursor will tend to jump as you move left and right. You wouldn’t see that sort of jump with a space delimited file. A second thing to notice is that there is a blank link between the variable names and the data. 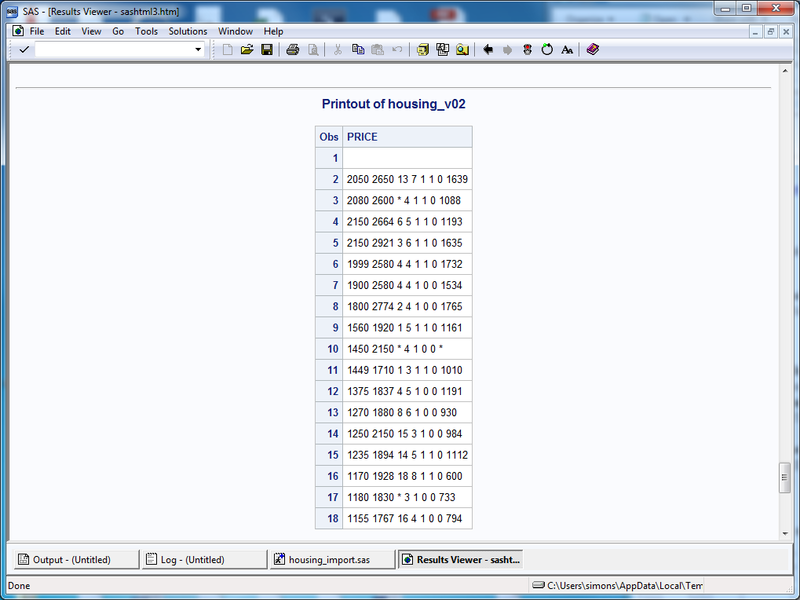 This makes the file easier to read on the screen, but is a minor problem for SAS. I’ll leave that blank line in for now. A third thing to notice, and this is super subtle, is that the variable names do not line up with the data beneath them. This is a hint that the first row is NOT tab delimited, but space delimited. You can see that by scrolling left and right in the very first line of the file. No jumping! This causes all sorts of problems. 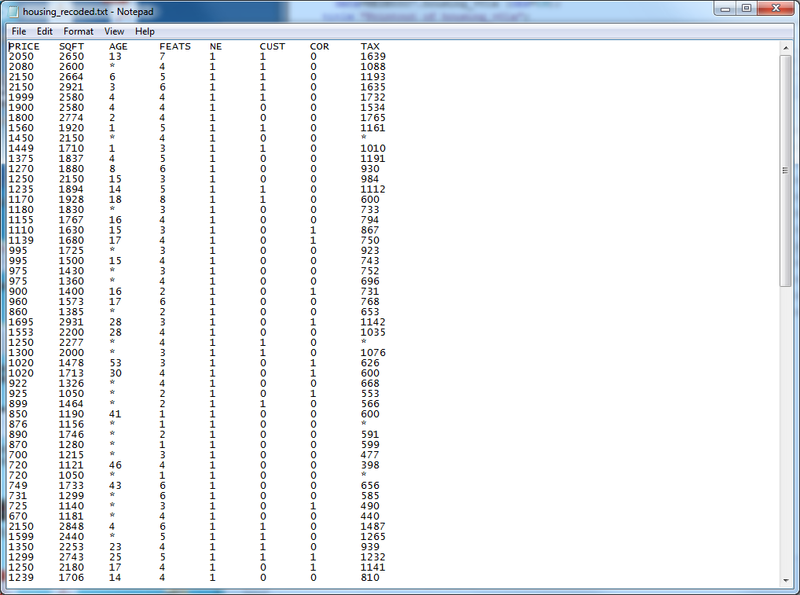 So here is the SAS code that I wrote to read in the file. When you run the code, you get a strange warning. Number of names found is less than number of variables found. Problems were detected with provided names. See LOG. There are two warnings actually. 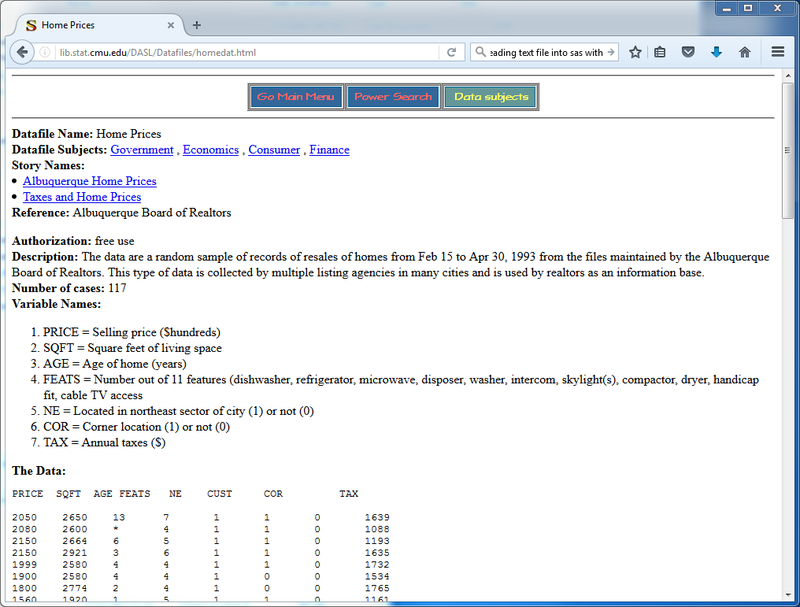 The first is that the number of names at the top of the file does not match the number of variables found in the data below. The second warning is that the name of the first variable had to be truncated. 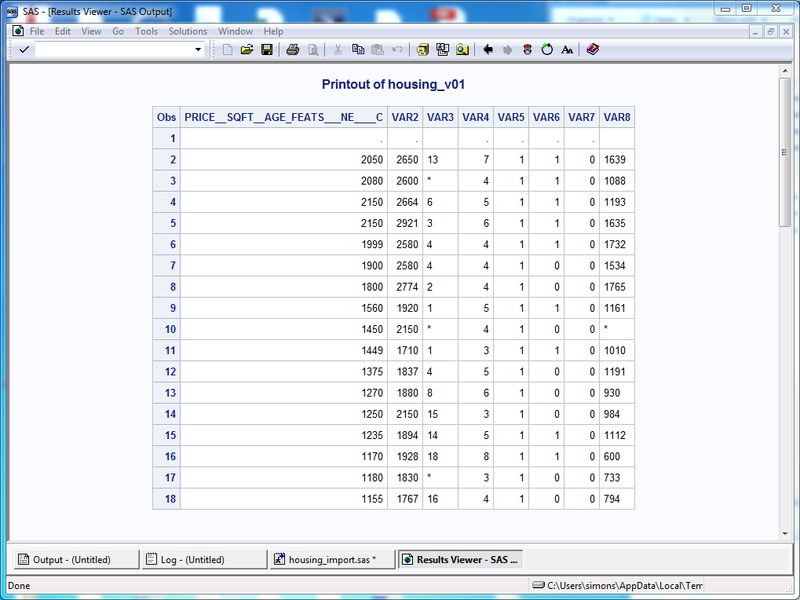 SAS is having problems with this file because it can’t separate the eight names found in the first line of code. Those eight names were separated by one or more blanks, and SAS was expecting (as you told it by the delimiter=’09’x statement) that those names would be separated by tabs. As you can see from PROC PRINT, the names were mucked up, and first line of data is all missing values, but everything else looks just fine. There are several ways to fix this. One way that DOESN’T work is to change from a tab delimiter to a space delimiter. When you do that, the variable names come in just fine, but the data is mucked up. You see this with a warning. Number of names found is greater than number of variables found. The results from PROC PRINT show that you have just jumped from the frying pan into the fire. The first way that does work is to patch up the file after the fact with the RENAME command. Here’s the SAS code to do this. You still have to fix the missing value codes, which use an asterisk rather than a dot, but that’s something I showed in an earlier file. You can also skip the first two lines of the file and specify the variable names with an INPUT statement. A third way is to retype the first line of the file using the tab key rather than the space bar between variable names. Here’s the SAS code for reading in the recoded file. AS you can see, there is more than one way to skin a cat.